It’s a bumpy but pleasant ride from Jeeva Klui, the sister property near the sea, to Jeeva Beloam and that really indicates the characteristics of our stay at Jeeva Beloam; this is surely an adventurous resort located in the middle of nowhere. If you choose to come directly to Jeeva Beloam from the International Airport it will take you 2.5 hours to the resort as it is located deep inside a national reserve in South East Lombok. So as Jeeva Beloam is quite remote and isolated, you can surely forget all about work and day to day struggles. This is really off the beaten track! The resort is beautiful and well built. The secluded area and rustic ‘close to nature’ bungalows with stunning views, just make it all! The resort has 11 of these bungalows called ‘berugas’ which are equipped with all basic needs. An extra bed and mattresses are added for our kids. Clean linens and towel, unlimited bottled drinking water and fresh water in the shower are available. It isn’t pure luxury; it’s a beach camp although a very comfortable one. If you're a gadget freak then it's kind of hard to stay here because WIFI is only found in the restaurant area and a generator for the electricity is not always working. But if you're looking for a place to relax as indulge yourself in all kind of sporty activities then this is the places for you. So for example in the early morning don't forget to go soft hiking to look at the stunning sunrise. Furthermore, there other activities like kayaking, snorkelling at Pantai Pink (Pink Beach) or Pantai Gambir and Gili Petelu and cycling around the property. As for Pink Beach, this not so far from Jeeva Beloam, around 15 minutes by bike or 10 minutes by pickup truck which is provided by the resort for free. It’s a nice calm beach; this one is great for the children to play and swim. You can snorkel and kayak here and set your feet prints in the nice, pink sand! Or rent a boat for island and beach hopping. Otherwise you might want to do a trekking to Batu Beloam. And after a day of activities you can get yourself a gentle massage and spa in the afternoon. Our kids also loved to do an afternoon game in the lovely library on the way to our beruga. Around the resort area you'll find some monkeys walking around, they are a bit shy and afraid of human contact so don't be afraid of losing anything because of them. Due to Jeeva Beloam spirit of "Go Local! ", our taste buds are entertained with tasty Indonesian food, made from fresh local ingredients. The food is meticulously prepared. Due to the remoteness and small size of the place, guests must order their meals in advance - once breakfast is finished, the waiter comes along and tells guests what's available for lunch allowing you to choose from 2 or 3 set meal options. Although the food was good and always well presented, it always took at least 20 minutes for food to arrive. However, this is typical in Indonesia - be patient in restaurants. As there are only 2 choices, if your children are kind of difficult eaters, that might be a problem! Don't think you can buy them an ice cream or something... Having said that, don't let it hold you to bring your little ones with you if, because as mentioned above - it's a real adventure and they are very welcome! And never mind, you’re soon used to the whole experience. At the time of our stay the staff were thinking of building a swimming pool near the restaurant. If that materializes, it would add a real bonus for children (and their parents). The charm of the place is also due to the staff. They are gentle and always ready to help you. Their enthusiasm for the resort and its surroundings is great. On the other hand: it wasn’t after the first day of our stay, getting used to the hot weather and the rhythm, we started thinking for ourselves…. Don’t forget to ask for whatever you would like to do, be creative in your activities or just ask for it, for example using wake boards on the beach or asking to light up the fire in the pit area in the evening. It is also possible to combine, as we did, your stay at Jeeva Beloam with a few days at Jeeva Klui. With a large beachfront infinity pool, a spa and a gym, Jeeva Klui Hotel is a wonderful place to rejuvenate. During our stay, the hotel offers a daily activity programme and there’s lots to do on Bali with Jeeva Beloam as a starting point. Lombok is a culturally diverse island. It has a large Balinese Hindu population that gives the island a distinct flair. It is also home to the Balinese royal palace and several large Balinese Hindu temples. # The sound of the waves crashing against the shore made us sleep like babies and the chirping of birds woke us up before sunrise. A truly beautiful experience. # The setting is stunning, the beautiful turquoise coloured sea and the beach in front was white and powdery, a delightful place for our kids to play and do some wakeboarding. 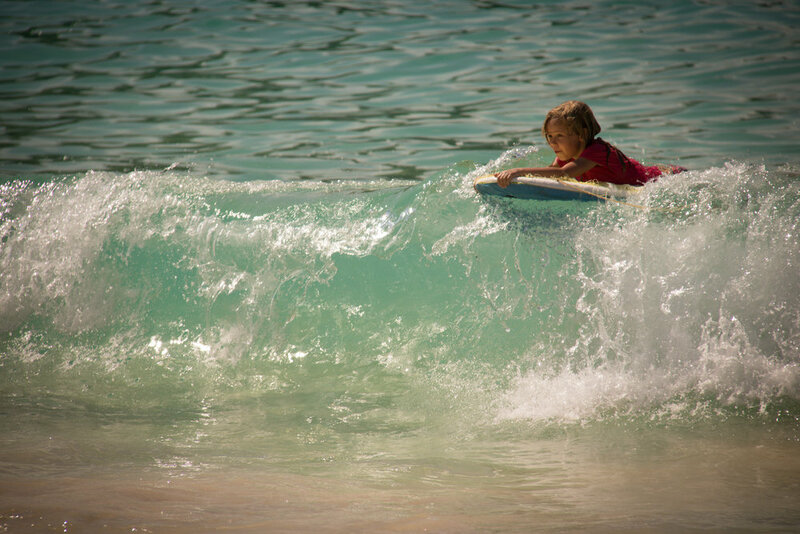 Close by you’ll find some other beaches where playing and swimming is perfect for kids. # This is remote: forget about everything and have a short sabbatical in this stunning beach camp.